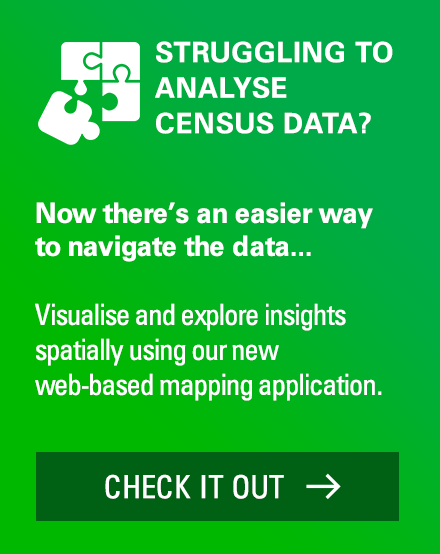 On July 28th, a month after the Census release, the ABS released updated population estimates for all Local Government Areas and smaller geographic units in Australia. Why is the estimated resident population out? This marks the end of an awkward month when the Census results for some areas were showing very different counts to the total population numbers. The Estimated Resident Population (ERP) is almost always a bit higher than the Census count, allowing for people overseas on Census night, and a few people missed by the Census, but for the last month we’ve had updated Census figures, combined with pre-Census estimates of population, which didn’t work too well. The new ERPs are based on 2016 Census data, with adjustments. We already knew the general shape of these adjustments, because ERP for states and territories came out a month ago, see our blog post about this here. But this release shows us the fastest and slowest growing areas around Australia, as well as how the estimates of some areas’ populations can drift out between Censuses, in some cases quite significantly. 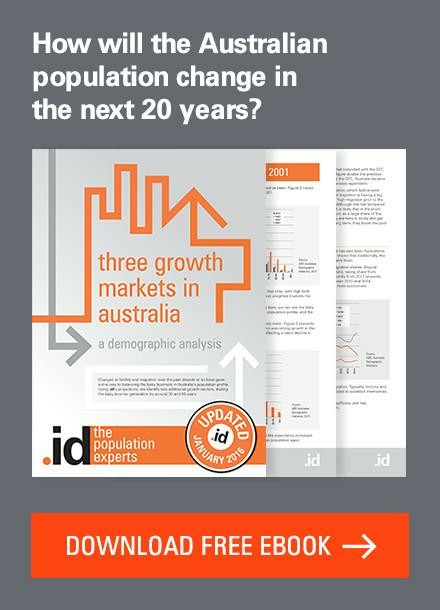 You can find all the population estimates in 3218.0 – Regional Population Growth, on the ABS website – and we are loading the new numbers into our community profiles and economic profiles as we speak. The new 2016 figures show the following as the fastest growing areas in Australia (greatest percentage growth over 5 years). 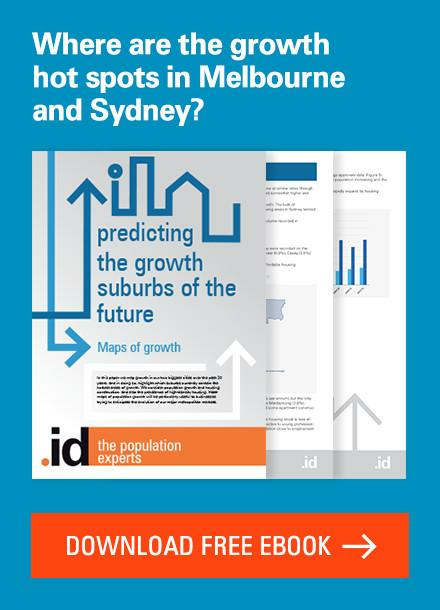 Serpentine-Jarrahdale Shire, a small shire on the southern outskirts of Perth, takes the crown as the fastest growing area in Australia, adding almost 50% to its population over 5 years. The city of Melbourne is next, with a much larger population to start with, adding 48% to this relatively small inner-city area. This table also shows how some areas can get “large” population growth from a very small base. Tiny Murchison Shire, in outback WA, added just 38 people to become the 6th fastest growing LGA nationwide! Its entire population is now a burgeoning 157 people…. Also of interest at the moment is the revisions – these show not how much an area has grown or shrunk, but how much the population has changed from what the ABS thought it was before the Census. But this is an inexact science, and in some cases, the 2016 Census led to some major revisions to what the population is now thought to be. This table shows that the ABS underestimated by quite a large margin the amount of growth in our inner city areas. The cities of Sydney and Melbourne top the list for having the largest revisions upwards in the new figures. Sydney has 13,280 people more than was previously thought, while Melbourne has 11,703 people more. 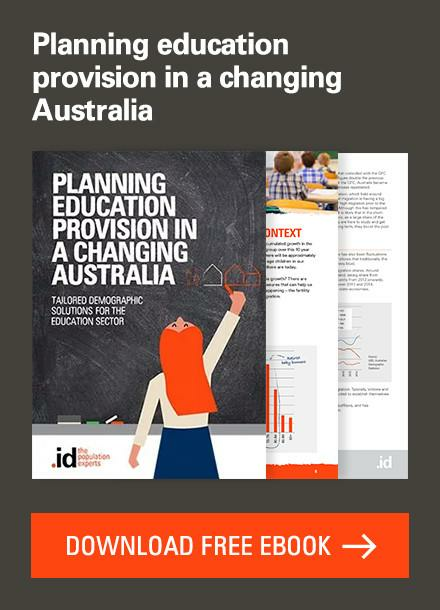 The good news is that in many cases with these revisions, .id’s population forecasts did better than the ABS preliminary numbers. 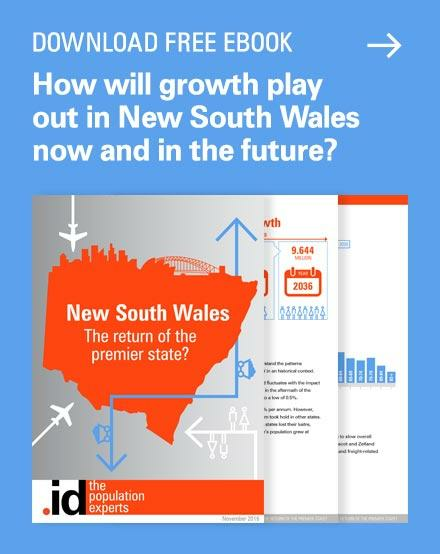 While, for Sydney, our forecasts are still below the revised figure, our estimate of 215,551 in the City of Sydney was still almost 5,000 closer to the final figure than the ABS preliminary. So inner city growth has taken the ABS by surprise. But generally, growth in Victoria has also taken Victoria by surprise. 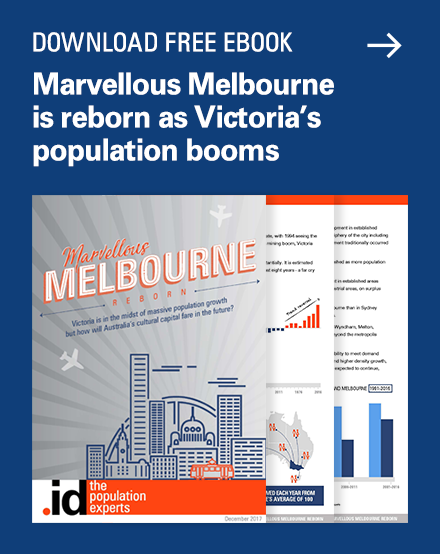 Victoria’s population overall was upgraded by 111,000 after the Census results, and five of the top ten revisions upwards are in Victoria. Apart from the City of Melbourne, the other revisions are all on the urban fringe, with growth in places like Casey, Wyndham, Hume and Dandenong all higher than expected. Canberra is in there, but represents an entire city/territory rather than Local Government Areas, which don’t exist in the ACT. Rounding out the list is Rockdale in NSW, which has now been amalgamated to form part of the Bayside Council. At the other end of the scale, the table below shows the largest DOWNWARD revisions in population between the preliminary and revised estimates. Western Australia makes up the lion’s share of these downward revisions, with 7 of the 10 largest drops being in the west. In particular, the northern suburbs of Perth, in the form of Stirling and Joondalup councils had the most savage revisions, with Joondalup actually moving from estimated growth over 5 years (in the preliminary numbers) to a decline (in the revised numbers). This is an area which mainly expanded in the 1990s, and the kids of the families who settled there are now leaving home, so this is not unexpected. 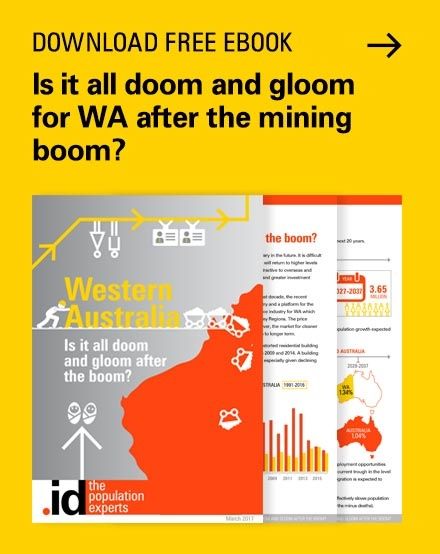 With the end of the mining boom, many of those kids are now leaving WA (not just Joondaup). This is reflected in a further revision downward, which the ABS didn’t catch on to (a reliance on Medicare change of address records doesn’t count young people too well, as they are less likely to go to the doctor). Mining areas in WA are also represented in Karratha, which suffered a 15% downward revision in population. 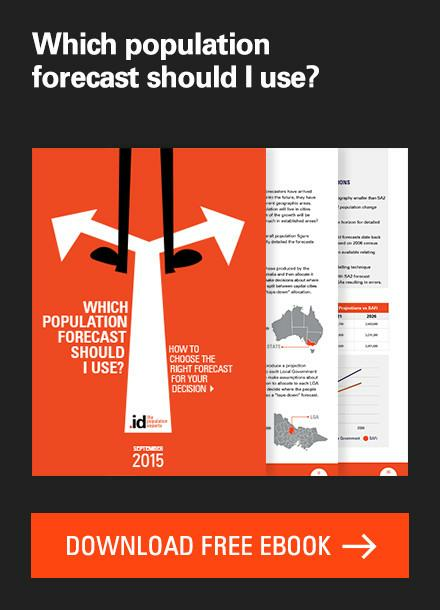 Again, .id’s population forecasts were closer to the revised figure, but we are still a bit over the odds. What this shows is that in the “in-between” years between Censuses, population counts for Local Government Areas become more and more out of sync with reality. We need the 5-yearly Census to put a measure of truth into these population numbers. In the meantime, .id’s forecasts, in the majority of cases, were closer to the “true” or revised figure than the ABS preliminary number (despite the fact that our forecasts are done in advance, and the ABS produces population numbers with the benefit of some hindsight). Did we get it right all the time? No, of course not. However, this is why we don’t attempt to match any interim population numbers the ABS releases when we develop our forecasts. Our population forecasts use a “bottom-up” approach, where we look closely at what’s actually happening in each local area (construction, migration, birth rates, etc). This builds up to a total for the Local Government Area, so our numbers are based on much more detailed information than the preliminary estimates from the ABS. The new population numbers will be loaded into our community profile and economic profile sites over the next 2 weeks. Follow our update tracker to be the first to know about this and any other updates as they happen. Previous story Is the tide still out on coastal growth?